OXFORD, Miss. – New signage at Gate 14 of Vaught-Hemingway Stadium will serve as a lasting tribute to University of Mississippi alumnus Roger Friou and his wife, Susie, who have made a major gift in support of Ole Miss athletics. “When Billy Brewer was coach here, I was a real insider,” said Roger Friou, who graduated from Ole Miss with bachelor’s and master’s degrees in accountancy in 1956 and 1959, respectively. “I really was. So that brought me close to the athletic department and, ever since, I’ve been a very active supporter of the athletic programs. So I just decided one day that it was time to make a gift to the athletic department. 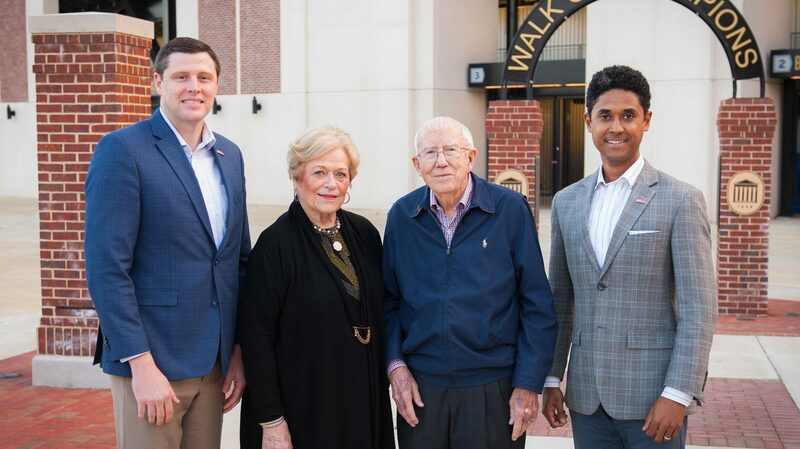 The Ridgeland couple’s $250,000 gift is part of the Ole Miss Athletics Foundation’s drive to honor donors with naming opportunities for each of the entrance gates at Vaught-Hemingway Stadium and The Pavilion at Ole Miss, the Rebels’ basketball arena. Friou hopes his gift will help improve the Rebels’ competitive edge. Matt Mossberg, a development officer with the Ole Miss Athletics Foundation, said he hopes the Frious’ gift will inspire similar support for the campaign. Friou might have attended a different university, except his mother, Annie Belle H. Friou, of Tupelo, sought the advice of a family friend on the best accountancy program available for her only child. In turn, Friou assures many young people also enjoy the benefits of his alma mater’s accountancy program through scholarships and other support, as well as utilizing his accountancy background through alumni service to strengthen the overall university. “Roger is a clear thinking, no-nonsense, passionate advocate for Ole Miss,” said Don Fruge, professor emeritus of law and chair of the Ole Miss Athletic Foundation Board of Governors. “He has an unswerving dedication to Ole Miss athletics, the Patterson School of Accountancy and to the University of Mississippi Foundation, having served as chair of the UMF board and a longtime member of the Joint Committee on Investments. Friou also served the UMF Investment Committee as chairman of its audit committee, the Accountancy Advisory Board and the Ole Miss Alumni Association. Friou and his wife became interested in establishing a second scholarship in 1998, when James W. “Jimmy” Davis was the accountancy dean and began efforts to increase the number of accountancy scholarships. With a $250,000 gift, the couple set up the Roger and Susie Friou Scholarship Fund. “At that time, there were no scholarships for freshmen who had already selected accountancy as their major. I decided that having such a program would definitely help to attract quality students to the accountancy program. “This has been very rewarding for Susie and me, presenting eight to 10 scholarships annually. Meeting each year’s scholarship group has been a great pleasure,” said Friou, who is a member of the Patterson School of Accountancy Alumni Hall of Fame and also a donor to a scholarship fund named for Davis and faculty endowments at the UM Medical Center. Friou has witnessed his investments making a mark. The undergraduate (No. 7), master’s (No. 9) and doctoral (No. 7) degree programs in the Patterson School of Accountancy are all ranked within the nation’s Top 10, with the undergraduate and doctoral programs placing Ole Miss as the No. 1 Southeastern Conference school in the national rankings. “It’s spectacular to know the Patterson School has come so far,” the alumnus said. “We have generous alumni support and outstanding professors. I’ve wanted to be involved as an alumnus because attending Ole Miss was such a life-changing experience for me. “My dad passed away when I was 14 but he left me just enough money to go to college, inspiring me to help deserving young people pursue college degrees. Friou began his career at Standard Oil (now Chevron) and retired as vice chairman and CFO of Jitney Jungle Stores of America in 1997. He served 14 years on the board of the Luckyday Foundation, which provides major scholarship support and other programming at Ole Miss for academically deserving students with financial need. The Frious are the parents of two sons, Tom and Stuart, and five grandchildren. Naming opportunities remain available for the grand gates at the north, east and west entrances as well as a limited number of individual gates. In 2018, the stadium’s south entrance was named for Diane and J.L. Holloway, of Ridgeland; Gate 4 was named for Doug and Jane Simmons, of Hollandale; and Gate 2 was named the Braddock Beagle Family Gate in memory of Larry “Big L” Braddock. For more information about the Gate Naming Initiative, contact the Ole Miss Athletics Foundation at 662-915-7782 or visit http://givetoathletics.com/gates.